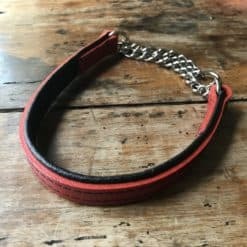 A beautiful, flat, Red and black padded leather dog collar (non adjustable) with a half chain. 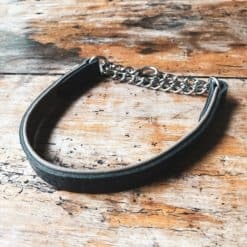 When it’s not attached to a lead it is comfortably loose with the chain resting around the throat, when the lead is attached, it tightens as the dog pulls, giving you greater control than buckle collars over dogs who are stronger. Padded collar. 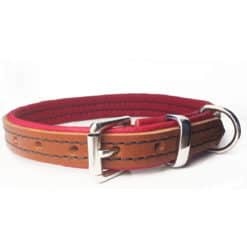 The outer leather is cut from shoulder hide, making it less stiff and more comfortable than bridle leather and the collar is padded with softer cow hide leather, which is folded around, giving rounded edges to prevent hair being pulled. Neck measurement Choose an optionNeck 13"Neck 14"Neck 15"Neck 16"Neck 17"Neck 18"Neck 19"Neck 20"Neck 21"Neck 22"Neck 23"Neck 24"Neck 25"
All dogs vary in size and even between breeds. 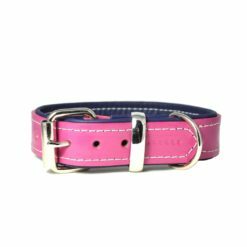 Here is a guide to measuring your dog for a perfect fit of their collar. 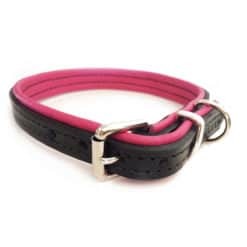 Please note that these collars may not be suitable for toy breeds or smaller breeds as the padded leather may be too heavy for their neck. 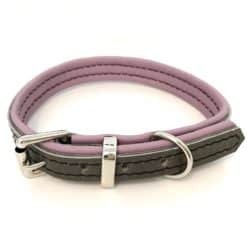 In these instances our puppy range of soft cowhide collars are a better choice. 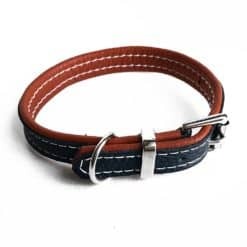 PLEASE MEASURE FOR YOUR DOG CAREFULLY If you are unsure please get in touch by clicking the help icon at the bottom of the page and we will be happy to advise.